Some people are born great, some people become great, some people have greatness thrust upon them. 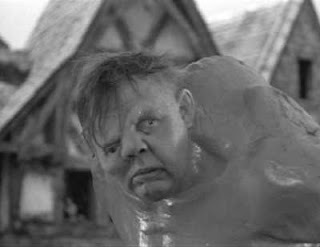 Similarly some people are born hunchbacks like Quasimodo of ‘The Hunchback of Notre Dame’. Others through their exertions, taking greater and greater loads on their back, instead of achieving greatness, end up with broken backs. Still others get their backs broken for no fault of theirs. The hunchback in my story belongs to the third kind. But hold on. Let us not jump straight to the hunchback. Let us start from where it all begins. I mean my story. Not life, the universe and everything. If that is what you want to read, I recommend you try the Old Testament book of genesis that describes how God went about creating the world over 6 days and before taking a day off on Sunday. Or if you are more scientifically inclined, maybe Stephen Hawking’s brief history of time may have the answer you’re looking for. Or if you think you are more the creative types, you might like to try Terry Pratchett's theory of of a disc shaped world supported on the backs of 4 elephants that are standing on the shell of a giant turtle swimming in the huge ocean that is the universe. I could go on and on with this but then that's besides the point.The point here is that I am not taking about all that. I am taking about me - I, me, myself. Where my story began. And that began in God’s own country, ‘Kerala’. So we begin my story. With a Blytonesque setting. You know those farm stories this British lady called Enid Blyton from early twentieth century used to write. City children land up at the home of their countryside relatives and on the fist morning, are woken up by sounds of cows, hens, sheep and other farm animals. Now take out those children and put the younger me in their place. And take the story out of Britain and bring it down to God's own country. And there you have the beginning of my story. We were not in the countryside as such - we were very much in the city only. But still the owner of the house we had rented out had managed to squeeze in a mini animal farm within his premises. He rented out the first floor to us while he himself along with his family occupied the ground floor along with half a dozen cows, a dozen each of hens and ducks, a rooster, possibly a drake as well and last not but not the least - a dog. Right next to the house was a pond. The balcony of our house overlooked this pond. The events I am about to narrate start with Rajiv Gandhi. He was then the prime minister of India and was coming to Ernakulam that day to address an election rally. I like our Congressmen, was obsessed with the Gandhi family at that time and was very eager to see India' own 'royalty' in flesh and blood. Luckily for me, our owner and his family were going to the rally and were willing to let me tag along. But then my mother had other ideas. She believed my time would be better spent at home studying for my exams coming up the following week. I tried my skills of persuasion on her. But persuasion skills have never been my forte then or now. When persuasion fails, you opt for brute force or stealth. Being of a non violent disposition, I opted for the latter. I got my chance when she stepped into the kitchen to do the dishes. The moment her back was turned, I began to tiptoe towards the front door. But then mothers have noses as keen as that of dogs. No mischief can escape them. Before I could climb on to the chair and reach the top bolt of the front door, she was upon me. I was seized by the scruff of the collar and hauled on to the balcony. My school books followed after me and the door was slammed shut. "Sit quietly and study for your exams. You can go and see Rajeev Gandhi when you are old enough to vote." What was I to do now? Here I was - stuck on the balcony with no means of escape like one of those heroes shut away in a tower prison. The door behind me was shut and I had no means by which to prise the door open. Quite the end of the road for my dreams to see the scion of Nehru-Gandhi dynasty in person, isn't it? But I was not the one to accept defeat so easily. What if the door behind was shut? The door ahead of me was open - the balcony overlooking the pond. I deftly jumped over to the other side of the balcony railing and climbed down to the sunshade below it. From the sunshade, I had to drop down holding on to its edge and swing myself on to the compound wall that separated the ground floor of the house from the pond. Rising up to half the height of the compound wall was a washing stone that would be a stepping stone for me to climb down. But somehow all that never happened and instead I found myself hurling straight towards the ground from the sunshade. I don't recollect if my hand gave way or my foot. I lost by consciousness before my head hit the stone. If it had hit the stone, it would have been the end of me. But since dead men write no blog posts and I am writing this, you would probably surmise that did not happen. The next think I remember is my head resting on something soft and low feminine voices murmuring around me. I was feeling severe pain in my arm and was too scared to even open my eyes. Initially I could not make any sense of the conversation. But one word caught my attention - my name. I at last mustered sufficient courage to open my eyes. I found myself lying on the ground my head on my mother’s lap. The owner's wife and two of her daughters stood nearby. Apparently my head had not hit the stone after all. I had manage to survive. How had this miracle come about? At the time of my fall, owner’s elder daughter Gracy had been washing clothes. Her stooping back had intercepted my fatal trajectory towards the stone slab. I had dropped safely on to her back and rolled off unhurt. Well, not exactly unhurt - I had a minor fracture in my right hand and lost a tooth. But fate had not been so kind to the girl. A 25 Kg child falling on one's back from a height of 15 feet is no joke. Her back had broken my fall but the impact had broken her back. And she was temporarily rendered a hunchback for no fault of hers. I still remember her fondly as my unwitting savior and only hope she eventually recovered and did not have to pay a lifelong price for my foolhardiness. Oh dear! Poor Grace.... Did you ever get to see Rajeev Gandhi BTW? No. Never got to see Rajeev Gandhi. He got assassinated while I was still at school. My God ! That's pretty bad that he got assassinated and you couldnt get to see him after all your misadventures. Yeah - Never seen any prime minister, nay not even a chief minister in my life. My mom saw Jawaharlal Nehru when she was 2. Yeah, indeed. Thanks for the read. Ha Ha - Now I think I can climb down without falling.